Cakes are available for delivery or pickup in the Greater Houston and Galveston areas. Susie's Cake Bakery makes a commitment for quality to our customers. We consider it a privilege to serve you and look forward to providing you and your guests with beautiful and delicious, fresh-baked cakes to serve at your special event. 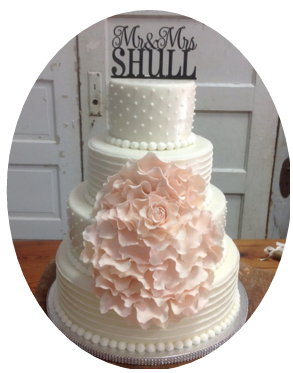 Devoted to the style and vision of each client she works with, Susie works personally with you by encouraging you to put your own signature and style into your cake selections. Choose from a wonderful selection of flavors and fillings made with the finest quality ingredients and you will experience the perfection that she puts every delicious creation! Susie's Cake Bakery also offers birthday cakes for children and adults, bridal shower cakes, baby shower cakes, baptism cakes, graduation cakes,and specialty cakes for all occasions!